Dordrecht pilot the project Stadswerven was chosen, a revitalising project next to the inner city. The project improves climate proofing at two levels: the Master plan and the individual building (Fig. 7.13). In order to do so, the flood itself as well as the possible damage is modelled and used as input in the design for the neighbourhood and buildings. 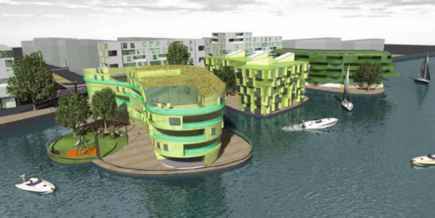 The design is adjusted if measures decrease the chance of a flood and increase the flexibility of the area. 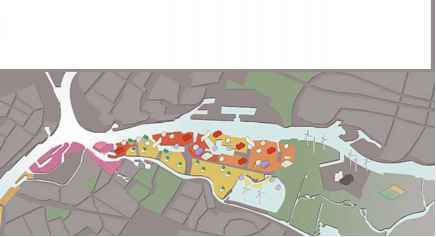 In the Master plan the flood strategy is introduced (Baca Architects, 2007), in which water - if apparent in large amounts - is used as a temporary quality in the urban design. By giving water a role in the city it becomes an archipelago (Fig. 7.14). 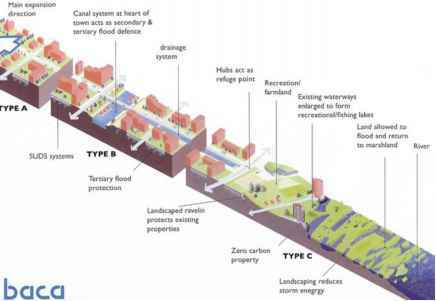 The new 'inlets' for water are combined with parks, recreation and artificial flood plains (Fig. 7.15). 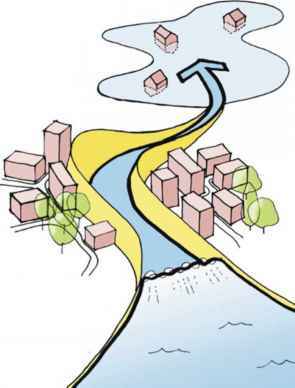 The translation to an urban design leads to different dwelling types and public space, designated by whether floods occur frequently, regularly or seldomly. The public space and the buildings are adapted to the specific situations (Fig. 7.16). 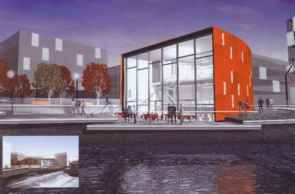 On top of this, in the design, integration takes place with a sustainable energy supply, transport and socio-cultural amenities (Figs. 7.17and 7.18). level rise, which increases saline seepage through the ground, which leads to saline groundwater (Fig. 7.19). manner. 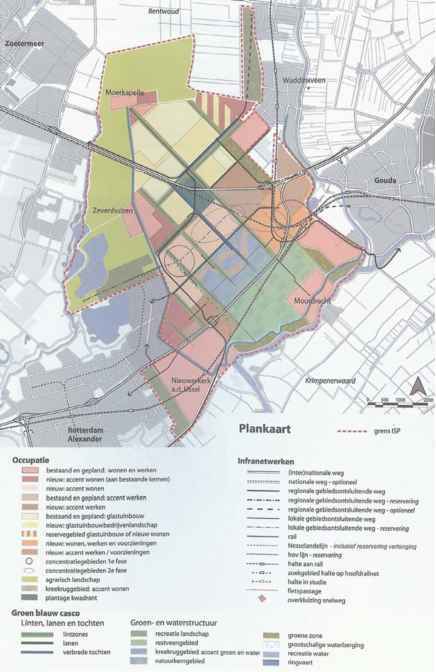 Therefore, Zuidplaspolder is given the special status of a hotspot in the 'climate changes spatial planning' program (www.klimaatvoorruimte.nl). carried out and finally, the climate proof quality of Zuidplaspolder is laid down in a covenant signed by all the partners involved. 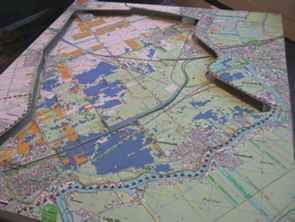 Haarlemmermeer is an area under pressure of several spatial claims. The low lying polder is almost the lowest part of Randstad Holland, where all water is collected naturally and needs to be pumped out again. Moreover, the soil is compacted, which causes the lowering of the ground level. Salinity strikes hard during the shortage of precipitation in summer. 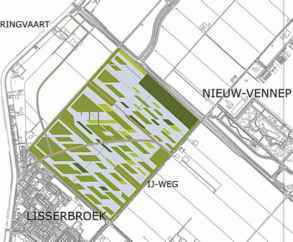 The changes in climate urge for substantially more water to be stored, while the existing spatial claims of housing, urban developments, noise barriers, the safeguard contours of Schiphol airport, nature and landscape does not all fit in the space available. If all spatial claims were added up the polder is circa 15% too small. There is not enough money to realise green space and nature, the existing building techniques have a negative impact on water, salination and compacting of the soil. 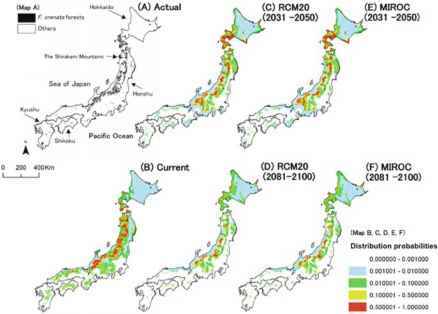 Yet, a sustainable water system, ready to meet the challenges of climate change, requires more space (Kuypers, 2007). The task is to design an innovative landscape, where green, red and blue functions can be combined. Only then can spatial wins be realised. The plan is developed from three points of view: Controlscape, Mindscape and Landscape. Technical research is conducted on market developments and water. This research is part of Controlscape. The research topics are the storage of water in extreme situations, dealing with safety and dynamics, the details of slopes and the natural circulation. The market study answers questions about target groups, the things to which they are attracted and if a competitive offer can be developed. Mindscape focuses on the involvement of stakeholders, the feasibility, organisation and finance. The aim is to create a structure and cooperation, based on trust, for the long term. Landscape focuses on the integral design for the area (Fig. 7.22). high and low densities. The infrastructure and space for parking is reduced to a minimum. The only way to reach the islands is by boats. 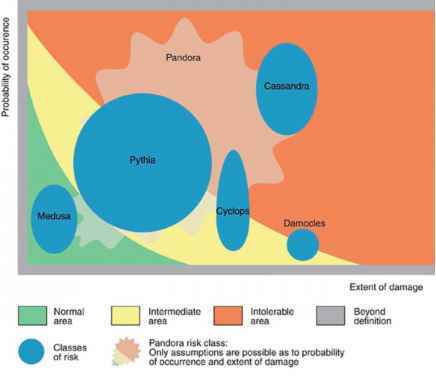 The market risk is spread out because of the flexible phasing, in time as well as in space. The net spatial win is around 15% - surface water even 50%. 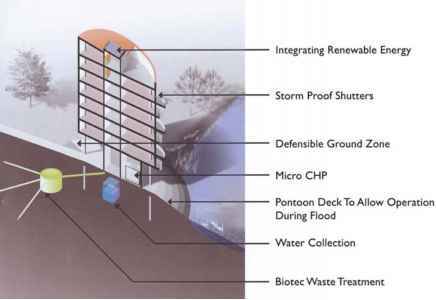 The storage capacity in the design is enlarged in order to store more rainwater. The financial return in this plan is 15% higher than in comparable plans, even without counting in the profit in water management. 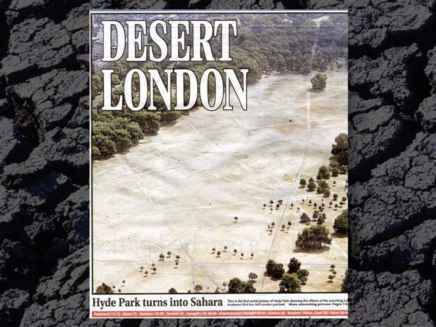 In the last century 38 heat waves have been recorded of which 11 occurred after 1990 and 6 after 2000. A heat wave is in the Netherlands defined as a period with minimal 5 consecutive days above 25°, of which three above 30° (KvR, 2007). 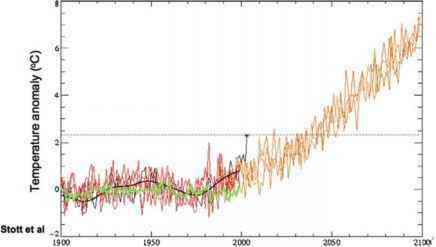 It is expected that heat waves will occur more often in the future (IPCC, 2007). Due to the rise in temperature, due to Global Warming, the average temperature in 2050 is predicted to equal the temperatures during the heat wave in 2003 (Fig. 7.23). This heat wave is one of the most extreme last century and many mortalities were recorded throughout Europe. 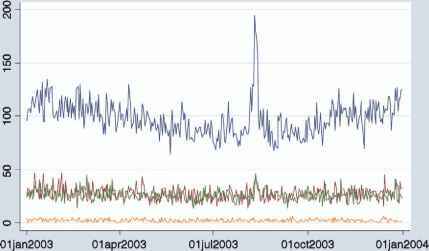 During the two heat waves in 2003 several hundreds of deaths were recorded in the Netherlands. Robine (Robine et al., 2007) states that the number of mortalities in Europa reached 80,000. In cities the effects were especially severe. Vulnerable people, like the elderly (Fig. 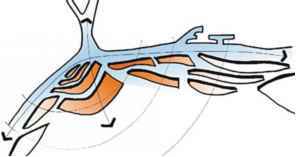 7.24), people with heart diseases and breathing problems were harmed the most. Under the deaths only a small number could be explained by the so-called harvest effect (Pirard et al., 2005). The harvest effect means that people die a few months earlier then they would have naturally. The effect of a heat wave is greater in the city than in the countryside, because cities heat up faster, due to the large amount of stone and pavement. During the night the temperature stays high. 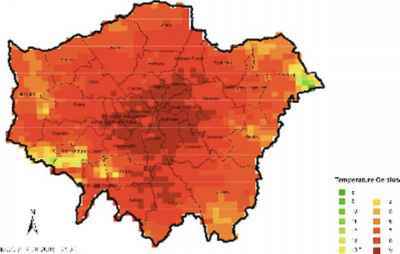 In an urban area like London the temperature can be 8-10° higher than the surrounding countryside (Fig. 7.25). This is called the Urban Heat Island effect (UHI). The city needs to be adjusted to minimise the effects of heat waves in order to prevent the population from buying air-conditioning units, which use large amounts of energy and thus exacerbate the climate problem. by the population (Kratschner, 2007). The PET can be used as a standard for heat stress in the city (Fig. 7.26). 2. In designing buildings the first win is to save energy. The saved energy will not contribute to the heat in the city. The use of white façades - which reduce radiation - the planting of trees and the use of 'cooling' materials can reduce the heating effects of buildings as well.